You may think that the life of a ranchwoman must always be a humdrum existence. But as proof that a middle-aged farm woman, raising children and chickens, making cheese and garden, need not always go out of her way to find thrills. I offer two experiences out of my life. Our Alta Vista Ranch takes in the mesa lying on the knees of a mountain in one of the loftiest ranges of the Rocky Mountains in Colorado. Behind the ranch the mountain rises, covered with giant boulders and spruce trees with blue-green needles and gray-green sage-brush and masses of slide-rock where the wild rose and raspberry bushes cluster, and blue wild columbines bloom, and deep gulches are filled from brim to brim with snow in winter and with floods of water when the thaw comes in late spring or early summer. In front of the mesa the earth drops steeply down; and there, at the bottom of the gulch, the Lake Fork tears along over the feet of our mountain which rises on the other side. In summer and fall the Lake Fork becomes a beautiful crystal-clear icy-cold trout stream, except when rains and cloudbursts send torrents roaring down the gulch, or during the spring break-up when the narrow channel can hardly hold the melting snows. It was these floods that took out the bridges in the vicinity of Alta Vista Ranch. At the time of which I write, one bridge only, near the ranch, had succeeded in defying the Lake Fork to dislodge it: the famous High Bridge. 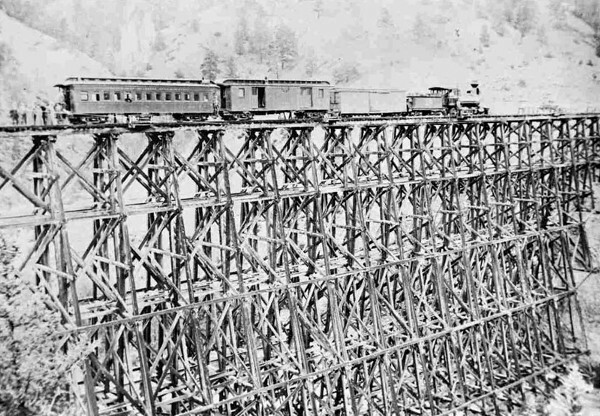 A marvel of construction, built entirely of timber, this railroad bridge carried the narrow-gauge trains four hundred and thirty-five feet across the gorge, a hundred and twenty-five feet above the stream. Built in the nineties to care for the ouput of the rich silver mines in these mountains, it is still in use and was for many years famous as the highest all-timber railroad bridge in the world. During an illness that kept my husband bedfast for several years before his death, the problem of producing and marketing kept the children and me busy. The river sometimes made this problem very difficult, for the road leading to the thriving mining town that was our market lay along the mountain over on the other side. In winter, we drove across on the packed snow and ice, beneath which we could always hear the threat of the water as it rolled over the boulders in its bed. One morning, I recall, toward the end of winter, we loaded eggs, butter, cream and cheese into the express wagon. A one-armed man who worked for us, an old neighbor who wished to go to town, and I, sat up in the seat, wrapped up against the mountain cold. A third horse was tied behind. The one-armed man, very capable for all his handicap, was driving. We had hardly got out onto the snow and ice over the river before discovering that it was giving way beneath us. The frightened team plunged and tried to turn about; the wheels shrieked against the side of the wagon from the sharp turn about; the wagon tipped and slewed on the collapsing ice and in we went. We made quite a splash and cakes of ice rose up all round us; but we landed right side up. Horses, tongue and single-trees were so tangled up that the driver had all he could manage. And the hole we had made was too narrow to turn in. The neighbor managed to pull the lead horse up close and got on his back. After reaching the bank, he made for home, a quarter mile distant, and brought back my thirteen-year-old son. Working in the icy current, he somehow unhitched the team and snaked the rig out backward. I had hung onto the seat; but every box, basket and jar had been tipped into the river. And that was that. But we were still on the wrong side of the river, and it was necessary to get across to get the medicine and supplies. So after gettng dried and warm, our helper and I started out again. This time we drove alongside the railroad track which runs across the meadow, until we reached the grade. There we drove right onto the track and bounced along the ties to the cattle-guard. I held the horses while the man laid down planks (which we always kept near the track for this purpose) for the horses to walk on. The horses danced across the planks, which were then put into the wagon for use on the other side. Once across the guard, the ground seemed to drop right out from under our feet as we drove out onto High Bridge. 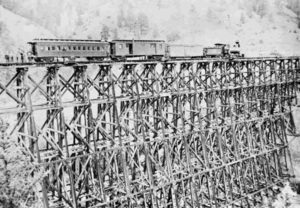 At that time planks were nailed down paralleling the rails all the way across and barrels of water were placed on the ends of the ties, to be used in case of fire. There is no railing on this bridge – nothing above the level of the rails. I seemed to myself the smallest creature on earth as I sat on the high seat and tried to keep from seeing the bottom of the gorge so far below. But reassuring the horses, I drove on steadily. Then the cliff rose suddenly to meet the ties and there was the firm though very narrow railroad grade. Even the horses showed relief when I pulled them up while the man put the planks over the cattle-guard. But my breath of relief came too soon, for, as we followed the narrow wagon road along the side of the mountain, with the rocky cliff rising on one side of the road and the drop into the river on the other, we came to a place where water had run down a break in the cliff and had covered the entire roadway with a great hump of ice that sloped steeply toward the river side. To drive onto that would end in the river below. And we could not turn. There was just one thing to do, and we did it; we clawed and scooped and carried in our hands, enough dirt and gravel to cover the ice, so that the horses could keep their footing. Even at that, their bellies nearly touched the ground as they scrambled across that hump. When we reached town, I phoned home that we had made it. 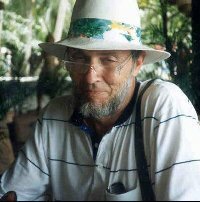 Then I bought the medicine and home supplies as quickly as possible, borrowed a pick and shovel to use on the hump and started homeward. I was desperately tired, and there was still that dangerous trip home, but I had learned long before that what had to be done, could be done. On another occasion, summer rains had swollen the river. The bridge below us had gone out some time before, so we were fording the stream whenever it was necessary to take the vegetables and dairy products to town. Radishes, onions, beets and carrots were washed and bunched. Peas were picked and put in a bushel basket. Eggs and butter were ready, and all was loaded into the express wagon. I looked them over with pride, for not only did they mean many, many hours of back-breaking labor for the children and me, but they were also an outward expression of our inner independence – we could make our living! And besides, very clean and fresh vegetables are things of beauty. I climbed up over the wheel and onto the seat, and took the reins from the hands of my thirteen-year-old son. He handed up his little sister, then mounted his saddle horse and preceded us. When we reached the river, my boy rode in to gauge the depth and to try to locate the crossing. We could not go straight across, because of the boulders in the bed of the stream; and now those great rocks were covered by the water and it was difficult to tell where they lay. Son seemed to be off the ford, for the water boiled around him, high up on the neck of the horse, but he finally made it back and climbed into the wagon. But even on the ford, the water was deeper than he had thought and soon the water was up to the wagon-bed and over the back of the mare and the current caught off the lap-robe off our laps and whirled it away. For just a moment its length swept like a live thing on the surface; but son had all he could attend to, with the team, and Little Daughter and I were holding onto the seat with all our might and had no time for lap-robes. Away went the vegetables, all so clean and bright. I shall never forget how the bushel of new peas rose on the surface, keeping a massed formation for a moment, covering the troubled waters where we were with vivid green and I recall brief amazement that one bushel of peas could cover so much water. The mare was fighting to keep her footing and both horses were frightened. If a horse got down, we would have no chance. And if the stream were still deeper ahead of us, its swift current would probably take the wagon down-stream in spite of swimming horses. Our only hope seemed to lie in turning and getting back to the bank we had left. I wish I might be able to make you see the way my thirteen-year-old boy acted. I never think of this experience that I don’t feel so proud of him that my heart fairly hurts. Inch by inch he eased the horses around over the rocky bottom, holding the mare steady when she seemed to be climbing with her forelegs onto a rock and then slipping off. But when the pull on the tongue began to turn the wagon, it began to upset, and the current got hold of the bed. It hung at a sickening angle and for the moment I felt paralyzed and hopeless. But he somehow found strength to pull the team back to their former positions and the wagon settled onto its four wheels. I didn’t try to give advice; he understood the dangers as well as I and he understood the river and the horses better than I. Since his father had been ill, he had learned to make decisions. “Mamma,” he called above the roar of the water, “we’re going across”. I looked at him and nodded. There wasn’t a thing I could do to help, except, of course, that I prayed. The horses were started at a slightly different angle but they seemed hardly able to pull the wagon at all. Only their own fear and desperate urging drove them to pull us across, with the wagon lurching and tipping over the rocky bottom and the horses plunging and slipping back. When we were finally drawn out on the opposite bank, and the horses stood with heaving sides as the water ran off them, we discovered that our long lap-robe had swirled around and through the spokes of a front wheel and around the axle until it was completely locked. We didn’t indulge in any celebration. Son gave me the lines and began untangling the lap-robe. We agreed that it would be best for me to come back by way of the High Bridge. He untied his riding horse from the end-gate and as he mounted, assured me that he would meet me to put down the planks at the hour I might name. I watched him while he forced his horse into the river again and made his slow way back across. He waved cheerfully and rode toward home. Little Daughter and I drove on to town. Only our wet feet showed what we had been through. We bought groceries and medicine and told our customers we would get their orders filled in a few days. I phoned my son that we were leaving town. Son rode across High Bridge and had the planks laid over the cattle-guard. Train-time was near and the horses seemed to know it. They could hardly be forced onto the guard, and then acted up so that they had to be led onto the bridge. Son lifted his sister off the wagon, for we thought it too risky to allow her to ride; and she came along behind. She had not once mentioned being afraid. The horses grew quieter after we passed the deepest part of the gorge and Son rode on ahead to lay the planks. As we neared the guard, they began dancing again and as their feet left the end of the boards, they began running in earnest. Straight across the narrow railroad grade they ran, with the wagon flying and bouncing so that it was all I could do to hold onto the reins and stay in the wagon. When we came to a place where I could turn them off the grade, they nearly jerked the wheels off in their eagerness to leave the track. They ran into the meadow a little way and halted. Having seen that his sister was over the guards and out of danger, my son was coming at a gallop; and away behind came Little Daughter, hopping along as fast as she could make it. Son and I looked at each other – and were able to laugh!